Remember the three old blokes who sat on the bar stools in the Prince of Prussia in the Jack Irish books and television series? They’d sit there, mentally replaying and commentating football matches concluded decades ago, yarning about footballers long gone with names like “Chicken Smallhorn” and “Captain Blood”. I must confess that I felt a little bit as if I were sitting on the middle stool in this presentation by Timothy Lambert at Ivanhoe Library today. But there were plenty in the audience who were obviously just as familiar with statistics and personalities from Melbourne footy history. Lambert took his time frame from 1929 to 1939, at a time when Richmond, Collingwood and South Melbourne dominated the VFL competition, while Hawthorn and North Melbourne almost folded. At a time of high unemployment, VFL Firsts players received £2 per match, although the seconds didn’t receive any payment at all. As a result, there was huge competition within a team to be selected to play. Under the Coulter Law, passed in 1930, no player could receive more than three pounds per match, but the wealthier clubs found ways to get around this e.g. John Wren’s famous ‘five pound’ handshake for the Collingwood boys after a match, or enticing players with the prospect of secure employment as South Melbourne president Archie Croft was able to do through his chain of grocery stores. He also lured so many interstate players that South Melbourne would be dubbed “The Foreign Legion”, with so many from Western Australia that it was suggested that they should be known as “The Swans”. The name stuck. Lambert also emphasized that the VFL and the VFA were still direct competitors at this time, with both League and Association games played on a Saturday afternoon, and with the VFA untrammeled in how much they could offer a player. Although this might suggest that the VFA would have been stronger, it was common for a player to play in the league for several years until they were picked up by a country club as a player/coach where he could earn £10 a game. Football was tremendously popular during the Depression. Entry was 6d. It has been estimated that during the Depression years, 1:10 Melburnians attended a football match on any given Saturday. In spite of 2018’s turnouts of more than 300,000 to a round, the ratio to population today would not be anything like that. So all in all, a real session for footy tragics! 2002, 136 p & notes. 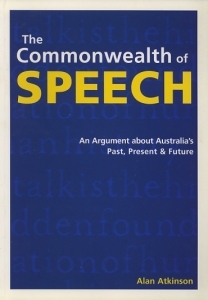 The full title of this book is The Commonwealth of Speech: An Argument about Australia’s Past, Present and Future . The extended title gives a better indication of the book’s flavour because it is a wide-ranging publication that meanders between history, politics, rhetoric and methodology. Many of the chapters were originally presented as speeches or lectures in their own right, thereby complicating for us the relationship between speech and writing from the start. Talking and writing were fundamental in the founding of Australia, Atkinson argues, and indeed the first chapter of Atkinson’s intended-trilogy The Europeans in Australia is titled “Talk”. When the Aborigines came across from Timor or Sulewesi, they must have used language to plan their trip, and by the time the English made their own journey in 1788 the logistics and implementation of the First Fleet was a product of detailed bureaucratic talk and writing. Unlike any other people in the world, the convicts and soldiers of the New South Wales penal settlement were recorded in writing from the very inception of the colony, in convict indents and admiralty documentation. Frontier life demanded writing, in the form of overseers’ orders, information from agents’ letters and the provincial newspapers that quickly emerged. When the early forms of democracy arrived, their introduction was largely unproblematic because of this underlying basis of literacy. Early white settlers recognized that Aboriginal people were highly attuned to speech. They noticed, even if they didn’t fully understand, that when aboriginal people spoke among themselves, there were nuances of affability, tact, respect and authority. This is something that white Australians are still learning today. Despite the ubiquity of text, talk is still important in both black and white communities. Atkinson spends quite a bit of time on Australia’s bi-centenary in 1988, examining the speeches given by Bob Hawke, Prince Charles and Galarrwuy Yunupingu for the occasion, and notes the power-plays jostling amongst the three speeches and the paradoxical symmetry between the speeches given by Charles and Yunupingu. In another chapter, Atkinson discusses what he calls “vernacular history”. He proposes three examples of Vernacular Historians: Manning Clarke, Robert Hughes and Henry Reynolds. All three, he says, presented themselves as unique figures, somehow independent of the community of scholars. Their histories burst off the page and broke out of the academy to become integrated into the talk of ‘ordinary’ Australians (albeit often at a fairly simplistic level). He spends quite a bit of time on Henry Reynolds in particular, whose history, Atkinson argues, is a history told from the perspective of “we” whites that relies on the tension borne of the moral relationship between current-day blacks and whites. I enjoyed reading this book, and I can see that I’ll be using it later in my thesis. I’ve been aware, in my work on Judge Willis, of the importance of talk- the talk of power in the courts, the middle-class respectable talk of men’s debating societies, and the gossip of the streets. I enjoyed spectating while Atkinson joustedwith other historians (an acquired taste, I admit) and his discussion of the use of history by politicians. Collective memory? No. Myth and memory? Nup. It’s all about me- it’s the historian’s memory- or lack thereof. I’ve been writing away for the past couple of weeks on a little topic in my thesis that has me all excited and flustered. I’m not going to go into specifics- not that I want to keep it from you, of course, but I must be a little circumspect and besides, who will buy “Judge Willis the Soap Opera” if I divulge all here? But I’ve been quietly rubbing my hands in glee, anticipating interest from well, all of about twenty people in a particular thing I’ve found. It was, as my earlier supervisor John Hirst would have said “a knock-down argument”. Except that I found it. And lost it. And now I can’t find it again. I’m rather obsessive about my record keeping. I could pretend that it’s because I’m a methodical person, but the truth of the matter is that, commencing this thesis at a relatively advanced age, I’m frightened that my memory is going to go before I get it written. I know that I sound like a hypochondriac, but perhaps you should consider my mother’s strong family history (five of seven siblings) who have suffered neurological illnesses of one type or another. I’m watching my mother’s brain slowly turn to cement, and I’m losing the Mum I love bit by bit. So my fears are not completely groundless. So, I turn to technology. In my research mainly I’ve been working on letters, dispatches and newspaper articles. I have an Access database that lists them chronologically by writer, recipient, topic, location 1, location 2 (because many of these letters are found it several locations). There are literally thousands of them – 1444 the last time I looked. Books and journals go into Endnote. I’m a fairly quick touch typist (faster than I could write by hand) so it’s no hardship to type up documents and I code them in NVivo. N Vivo is intended as a qualitative research software program, but you can use it to code the themes in any sort of document or artifact. I use it at a fairly basic level for data recovery only. When you want to find all the material you have coded on a particular theme, it collates it into one document. When I type up notes on a book or journal, it goes into NVivo as well. Of course, this is the weak spot- if I don’t code the document, then I won’t find it in NVivo. But I usually print out a hard copy and tick off on the top once I’ve put it into Access (if applicable), Endnote and N Vivo. So how have I lost this letter? I just don’t know. I have a fairly vivid dream life- did I just DREAM that I read it? I can’t work out why I didn’t make a note of it somewhere; why I just put it back into its plastic sleeve. And yet I have my chapter plan written a couple of weeks ago where I can see that I thought then that I had read it. I must have read it in-between entries on my other ‘secret’ blog that I write about my thesis-writing because I don’t mention it there. I’ve found one small reference, and another letter that perhaps I had misinterpreted. Did I just misread it? Did I conflate the two? I’m distrusting myself, and that’s not a good thing. For those of you writing history, how do you keep a track of everything you have?